The normal mentoring period spans three months with one meeting per week usually in the late afternoon or early evening. Meetings are held over the telephone or Skype and students share my computer screen where I have a prepared lesson plan. A typical lesson involves watching a chart (stock, futures, or forex) unfold one price bar at a time. The student is asked to draw the appropriate lines on the chart and explain the meaning of the price bars. No one begins this exercise until I have presented basic information on how to read the individual price bars. This includes a study of volume, price range, position of the close, and interaction with various kinds of lines. Other lessons involve looking at individual charts and determining if the market should be bought or sold short. Many traders are interested in learning about my Weis Wave software which subdivides price and volume into buying and selling waves. Proficiency in reading these wave charts first depends on an understanding of the concept and then sufficient practice so that their trade setups become readily apparent. 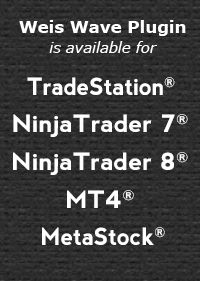 At this time, the Weis Wave plugin is compatible with the TradeStation®, Ninja Trader®, and MetaStock® platforms. To discuss your personal mentoring program, please contact us.